I love your card. That image is great. It is so sweet and uplifting. Thanks for hopping. Awesome card and have been enjoying more of your blog. This is how I never get to the end of a hop! There is so much to see and inspire. Thanks for the tip, too! It looks like Melissa didn't have time to make a blog hop entry... the next blog on the list after you is Nicole. So cute, I love the heart on his sweatshirt! This is just a darling image! TFS! How cute! Thanks for participating in the OWH blog hop from a fellow blogger! Really really nice! I think the stars just set off that really sweet bear. Love it. This is so sweet Amy.. I love the image you chose. It is so great to see so many familiar names on the list for this hop.. Hope you are having a super weekend..
You made a wonderful card with the digi stamp, very cute. Amy, this bear is adorable, love the smiley faces on his knees. What a great card! And the bear...TOO cute! How cute! Love the stars! Did you use a punch? Thanks for sharing! thank you for sharing your wonderful cards, they are all awesome. Great card. I love that image. TFS. Look at that darling bear! Your coloring is exquisite. . . .
Great card! I love that little bear! Thank you for supporting our troops! Even the bear's knees are smiling ... and so will the person who receives your cute cards. You did such a great job with that digi! I'm nearly done hopping, can't wait to print out all the new freebies and get out my Copics! I just DL'd this digi... can't wait to play with it! Adorable card, thanks for sharing. Nice job on your card and I like your tip about how to glue the chipboard stars to a raised panel. Thanks! And thanks for supporting OWH! What a cute image! I love how you used it on your card. Very nice!! Fantastic card, Amy! Adorable image. Such a sweet card! Love that teddy bear! Have a great weekend! cute card, i love the bear! Love the cute little bear!! !Your card is very cute!!! Thanks for supporting OWH! Hi Amy! Cute card! Thanks for joining the Hop. Awesome card, just love that bear. Great card- cannot wait to find and download that bear! Cute image and a wonderful card. Thanks for participating on the hop. Your card is so cute! Your layering is just terrific! Thanks for being involved with OWH. What a great card. Love the ribbon on both sides of the blue section. Hi Amy! Thanks for sharing that adorable starry card - I love your work here! Following so that I can come back and check out more! Great card and thank you for remembering what Memorial Day is all about. 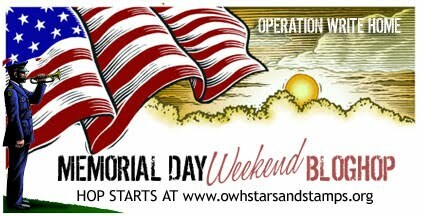 Thank you for supporting our Heroes and OWH. Cute card! I'm partial to bears so this is extra special!! Your card is so cute. I love the image you used. Very nice card with the cute bear image. Thanks for sharing. What a great card! This will certainly brighten some one's day. Love what you did with the stars. Thank you. I love the way you framed the image! Cute card. Thanks for hopping.